I had an instant design vision for this backyard the moment I saw it. I envisioned a romantic gazebo in the corner, a new handcrafted wood fence, and a raised tumbled stone wall with a swath of Geranium incanum cascading over it. In a flash, it all came together in detail and just as quickly, the elements started to disappear as I spoke to my clients about the budget. Board by board, stone by stone my lofty design was deconstructed and faded into the thin air whence it came from. The only thing left was the geranium and my positive attitude. “Great, I’ll just have to get creative with materials,” I thought. Up to the challenge, I assured my clients that they would have the beautiful garden they always dreamed of and I would do it on their small budget. The concrete block wall had to stay, so I had the homeowners paint it themselves to save money on labor. The cost of paint was a lot less than a new wood fence and the dark green color made it less obtrusive. Instead of the shady gazebo, I opted for two Cassia leptophylla “Golden Wonder” trees to form a natural shade canopy and crown the sitting area with it’s golden yellow flowers in the summer. After- New sitting area and raised stone planters. 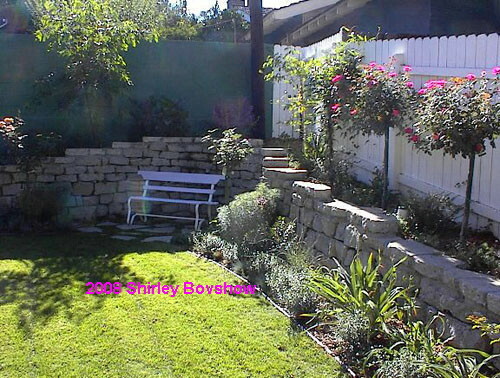 I had a stacked stone wall built along the entire backyard, creating a second level for plants. Instead of expensive natural stone, (like in my vision), we used recycled concrete for a fraction of the price without compromising on charm and good looks! The broken concrete pieces were also used to build the small pad for the garden bench. 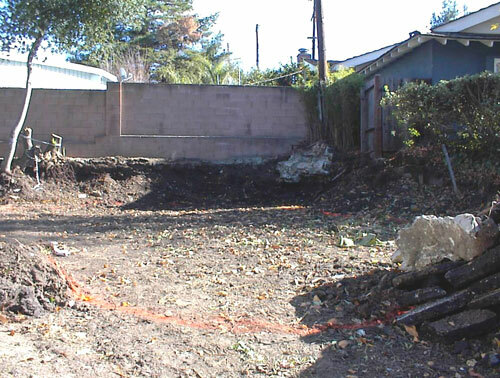 Before- Diagram your new path and garden beds to make sure you like the flow before digging in. 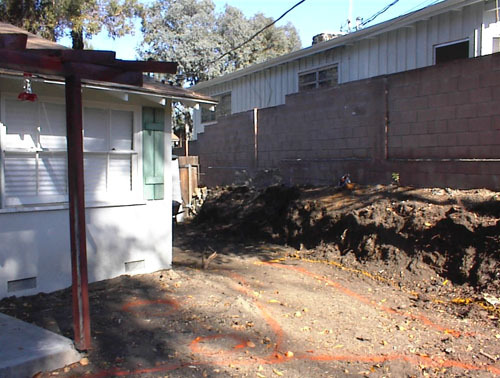 The side yard was used to house trash cans but my plan was to reclaim the space as an outdoor dining and barbecue area. After- The plan comes together just as I imagined it. The white arbor stands at the entrance of the new dining area and creates a romantic transition between the backyard and new outdoor dining room! After- A second level in the garden adds depth and interest. 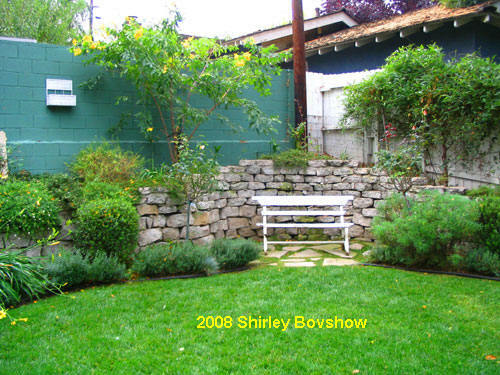 A variety of perennials soften the stone walls on the bottom and top levels. The raised area near the dining room is planted with veggies and herbs for convenient access. I’m a firm believer in year-round color through perennial plants that flower different times of the year. I do use annuals in containers and focal areas, but I don’t rely on them to “carry” my gardens. In this zone 20 garden in Los Angeles, I am fortunate to have the type of weather that supports a year-round garden. After- Garden art is always a welcome feature in an English garden, as are cute little dogs! The “workhorse” plants that I selected for this garden were chosen for their extended bloom time, low maintenance and low water needs. Alas, Paradise has its shortcomings- a drought issue! I invite you to visit my website to view other projects I have completed. Hi Thanks for visiting! I submitted a few different colors including a yellowish gold (my favorite) but the homeowner liked green best. How’s landscaping in the UK these days? Thank you Katy for commenting! I’m sure you agree that every square inch of land can be designed to be beautiful and functional! Amazing and excellent work! You truly rose to the challenge of a small budget and accomplished what the client wanted. I also love what you said about turning unused spaces into something useful instead of just standing there looking pretty. Pretty and functional always a sure win. Awesome job Shirley! Thanks for the idea. I will put “Shade gardening” on my to do list. Thanks for visiting. 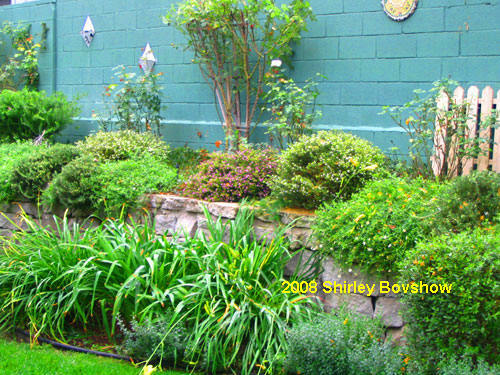 What a great interactive website – do you have any past posts on shade gardening? I love the look of your garden. 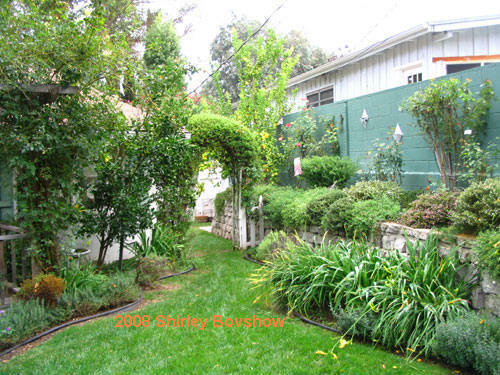 I am interested in transforming my yard into low water and low maintenance but want to keep the English Garden look. I live in southern CA and many of the plants you used will work for my area. Do you have any tips for actually designing the layout? One side of my front yard is full sun and I think I might be able use some of the plants you used in the photo with the “garden art”. The other side is shady with partial sun. 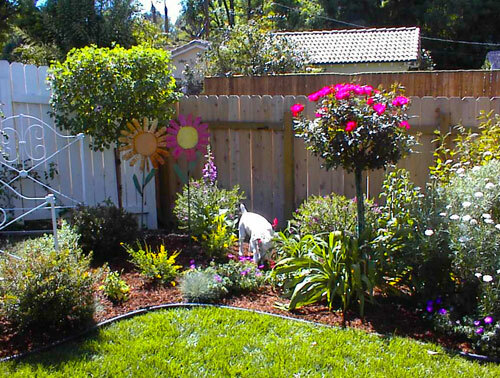 Do you have any recommendations for low water/maintenance plants shady/partial sun area? On the shady side of the yard we have a lovely large tree (not sure what type) in the center of the front lawn. I would like to consider removing the grass but I am a little unsure and not sure what to put in it’s place. Any suggestions? I am looking around your blog and see that you’ve been very busy. I love this makeover/long term plan for the gardens above. They are stunning. We are in the middle of another long drought filled summer. I can use some of those plants you have listed above in my new yard. Very nice job on all your projects. I can see you are in high demand and I’m still so honored to know you. The door is still open when you come to NC. Hi Cinj and Lin- It’s good to see you two back! Thanks for the compliments. We did experiment with a few different colors and yellow was one of them. The homeowner really liked the green color, so we went with it. Painting walls and fences neutral colors is an affordable way to buy time before they are changed out completely. Paint can make an unattractive fence less of a design issue. Good job! I like your choice of plants and painting the wall was a good idea. I wonder how it would have looked painted yellowish gold? I can see why you’re successful! Wow. That’s wonderful. What a transformation! I hope my garden sees such a fabulous change someday soon. Thanks Nancy. You are up early today. What an extraordinary job you did — you turned what looked like a forgotten back alley into a little paradise where I could envision myself spending many hours. Well done, Shirley!